Thursday’s call for caramel! 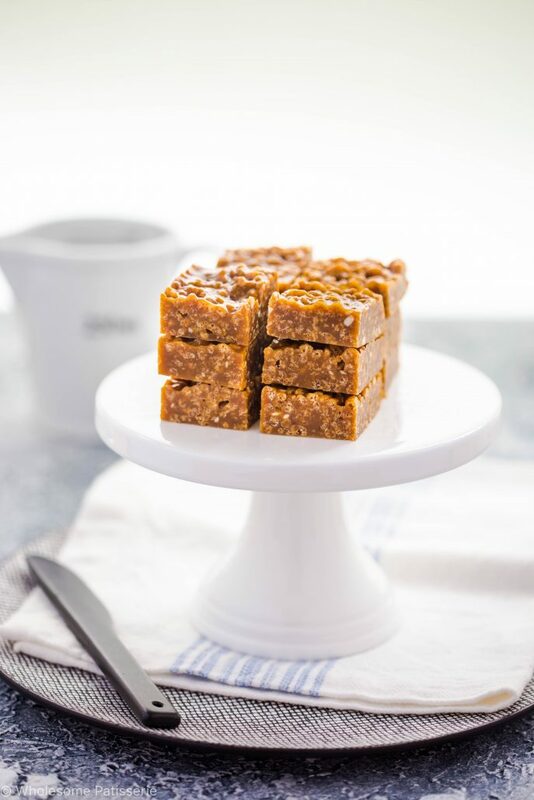 These caramel fudge squares are so decadent, so soft and I’m going to warn you right now, they’re addictive! I’ve actually re-vamped this caramel fudge slice recipe from one of my old previous recipes here on my blog. I did this because I’ve made this recipe many many times because it’s a household favourite and I have changed the quantities of the ingredients and it’s so much more delicious! Although this caramel slice is not dairy free, it is gluten free! If you find and decide to use gluten free rice bubble puffs like I did. I found mine just from my local health food store. Generally there are called rice puffs or rice bubbles. I’ve also used chocolate rice puff/bubbles for this caramel slice, either will work! The chocolate puffs don’t provide too much chocolate flavour to distract from the caramel so it’s all good! I love this easy caramel fudge slice because of just that, it’s EASY! All made in one pot, now those are my favourite kinds of recipes! 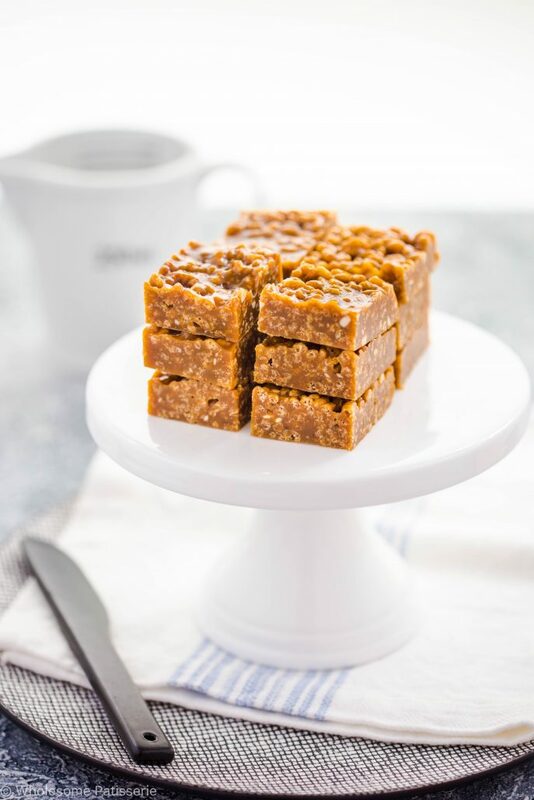 When you need that sweet treat but you don’t have much time do make it in, these caramel squares are your answer! I made it over the weekend before I left for the morning so they would be ready when I got home, so simple, fast and delicious! I have tried this caramel slice with coconut oil instead of butter but it didn’t quite work out the same. The coconut burnt, the texture was off and so was the flavour. I’ll have to perfect the whole coconut oil-caramel method one day. 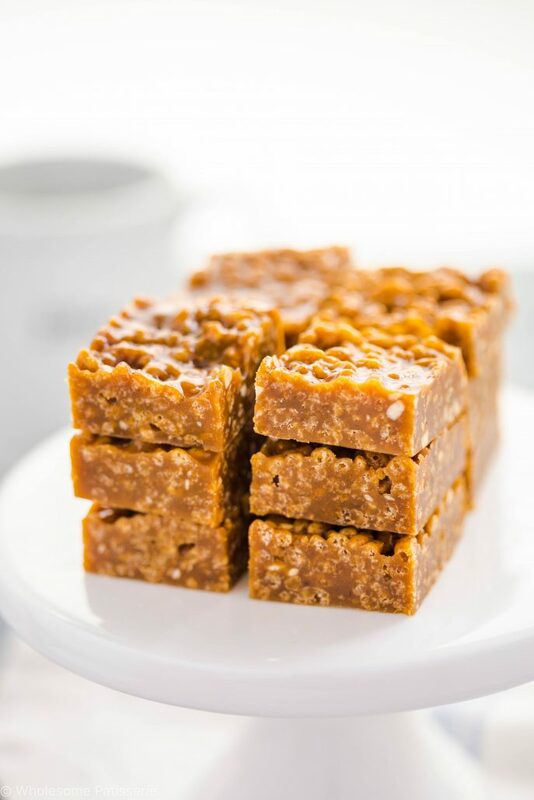 For right now though, true caramel to us traditional baking foodies is made with butter, unfortunate for our vegan friends but as I said, I’ll work on a vegan caramel fudge slice for you asap!! 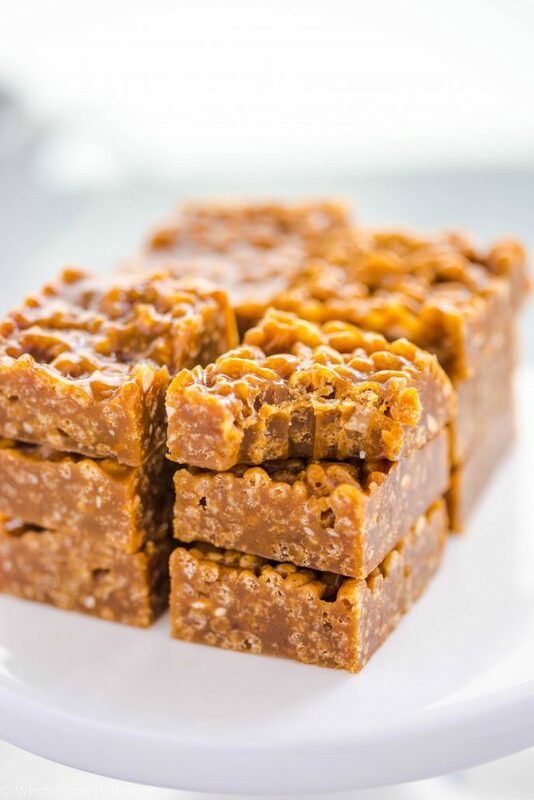 I’m going to leave you here guys because I can sense that you want to get into your kitchen to whip up a batch of these incredible caramel fudge squares! Enjoy! Line a 8” x 8” square baking pan with parchment paper. Set aside. Melt butter, sugar, peanut butter and honey in a medium sized saucepan over low/medium heat. Turn up heat to high and bring to a boil. Boil mixture for 1 minute, keeping an eye on the pot, making sure mix doesn't boil over. Remove from heat and stir through rice puffs until they are well coated. Pour mixture evenly into prepared pan. Refrigerate until completely set, approx. 1 hour. Before slicing into squares, let the slice thaw on your kitchen bench for 10 minutes. This will soften the caramel making it easier to cut and eat. *Use any gluten free rice puff/bubble cereal. I use ‘Freedom Foods Rice Puffs’. Would this work replacing the butter with another dairy free substitute such as Nutalex? Hello, yes, I’ll take about a million of these to my doorstep right now. I’m in love!